"This day at Belsen was the most horrible of my life. For public opinion in Western countries in the immediate post-1945 period, the name "Belsen" became emblematic of Nazi horrors in general. The even greater horrors of Auschwitz, a camp which was liberated by the Soviets and of which Western soldiers and journalists had no direct experience, became widely known only later. In September 1939 a prisoner of war camp was established at Fallingbostel, and the nearby Bergen-Belsen site became a Häftlingslager, or "prison camp", initially housing around 500 prisoners who were used as construction workers for the Fallingbostel project. In June 1940 it became a prisoner of war camp for around 600 French and Belgian soldiers, under the authority of the Wehrmacht, and in May 1941 it was designated prisoner of war camp Stalag XI-C, (Stalag XI-C/311 for the Belgian and French POW's). Conditions in the camp were very basic, with inadequate food and little shelter. Around 20,000 Soviet prisoners of war were sent to the camp between July 1941 and the spring of 1942, of whom about 18,000 died of hunger, cold and disease. In 1942, Bergen-Belsen became a concentration camp, and part of it was placed under SS command in April 1943. Having initially been designated Zivilinterniertenlager ("civilian internment camp"), in June 1943 it was redesignated Aufenthaltslager ("holding camp"), since the Geneva Conventions stipulated that the former type of facility must be open to inspection by international committees. This was the "Star Camp" (so called because the inmates were made to wear the yellow star badge that designated them Jews). The Star Camp held several thousand Jews, mainly Dutch Jews, who were intended to be exchanged for German civilians interned in other countries. Star Camp inmates were made to work, many of them in the "shoe commando" which salvaged usable pieces of leather from shoes collected and brought to the camp from all over Germany and Occupied Europe. Families were permitted to meet during the day, and in general the Star Camp prisoners were treated less harshly than some other classes of Bergen-Belsen prisoner until fairly late in the war, due to their perceived potential exchange value. From September 1943 Italian military internees were also held at Bergen-Belsen. In March 1944, part of the camp was redesignated as an Erholungslager ("recovery camp"), where prisoners too sick to work were brought from other camps. In August 1944, a shipment of approximately 8,000 female prisoners of various nationalities arrived from Auschwitz, most of whom were sent to Arbeitskommandos to work in factories, and from October 1944 captured Polish Home Army soldiers also began arriving at the camp. In all there were eight separate sections to the camp with different groups, treated differently according to their status. December 1944 saw the completion of the change-over of Bergen-Belsen into a concentration camp when SS-Hauptsturmführer Josef Kramer, previously at Auschwitz-Birkenau, became the new camp commander. 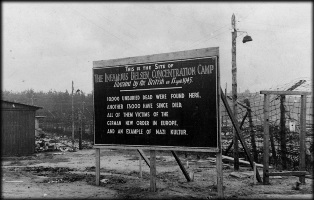 The number of inmates in the camp on December 1, 1944, was 15,257. In 1945, large numbers of prisoners were moved to Belsen from the eastern camps as the Soviet forces advanced. The resulting overcrowding led to a vast increase in deaths from disease (particularly typhus) and malnutrition in a camp originally designed to hold about 10,000 inmates. The number of inmates increased from 22,000 on February 1, 1945, to 41,520 on March 1, 43,042 on April 1 and ultimately to about 60,000 on April 15. The number of deaths increased from 7,000 in February to 18,168 during March and 9,000 during the first half of April. The bodies of these prisoners were buried in mass graves. There were no gas chambers in Bergen-Belsen, since the mass executions took place in the camps further east. Nevertheless, an estimated 50,000 Jews, Czechs, Poles, anti-Nazi Christians, homosexuals, and Roma and Sinti (Gypsies) died in the camp Among them were Czech painter and writer Josef ?apek (est. April 1945), as well as famous Amsterdam residents Anne Frank (who died of typhus) and her sister Margot, who died there in March 1945. The average life expectancy of an inmate was nine months. When the British and Canadians advanced on Bergen-Belsen in 1945, the German army negotiated a truce and exclusion zone around the camp to prevent the spread of typhus. Under the agreement, Hungarian and regular German troops guarding the camp returned to German lines when Allied troops liberated the camp on April 15, 1945. Although many SS guards had fled the camp, a small number remained, wearing white armbands as a sign of surrender. The retreating Germans sabotaged the water supply to the barracks, making it difficult for the Allied troops to treat the ill prisoners. Bergen-Belsen concentration camp was then burned to the ground by flamethrowing "Bren gun" carriers and Churchill Crocodile tanks because of the typhus epidemic and louse infestation.The name Belsen after this time refer to events at the Bergen-Belsen DP camp. In spite of massive efforts to help the survivors, about another 9,000 died in April, and by the end of June 1945 another 4,000 had died (after liberation a total of 13,994 people died). On the 13th day after liberation, the Luftwaffe bombed one of the hospitals in the DP camp, injuring and killing several patients and Red Cross workers. The total number of deaths at Bergen-Belsen from 1943 to June 1945 was about 50,000. Bengal Famine Mixture. This is a rice-and-sugar-based mixture which had achieved good results after the Bengal famine of 1943, but it proved less suitable to Europeans than to Bengalis because of the differences in the food to which they were accustomed. Adding the common ingredient paprika to the mixture made it more palatable to these Europeans and recovery started. Many of the former SS staff that survived the typhus epidemic were tried by the British at the Belsen Trial. At the trial, the world got its first view of Irma Grese, Elisabeth Volkenrath, Juana Bormann, Fritz Klein, Josef Kramer, and the rest of the SS men and women who before served at Mittelbau Dora, Ravensbrück, Auschwitz I, II, III, and Neuengamme. Many of the female guards had served at small Gross Rosen subcamps at Neusalz, Langenleuba, and the Mittelbau-Dora subcamp at Gross Werther. [clarification needed] Dozens of the personnel of Bergen-Belsen were found guilty of murder and of crimes against humanity, and most of those were hanged. Bergen-Belsen fell into neglect after the burning of the buildings and the closure of the nearby displaced persons' camp. The area reverted to heath, with few traces of the camp remaining.Ronald Reagan's visit to West Germany in 1985 (see Bitburg) included a hastily arranged stop at Bergen-Belsen, which prompted the West Germans to put together a small documentation center. It soon became inadequate for the accumulating archives, for the general liberalizing process of German identity building after the Berlin Wall fell, and for the growing public appetite abroad for Holocaust museums, along with the tourist economy they generated. On April 15, 2005 there was a commemorative ceremony, and many ex-prisoners and ex-liberating troops attended. In October 2007 the redesigned memorial site was opened, including a large new Documentation Centre and permanent exhibition on the edge of the newly redefined camp, whose structure and layout can now be traced. The site is open to the public and includes a monument to the dead, some individual memorial stones and a "House of Silence" for reflection. We were headed for an airstrip outside Celle, a small town, just of Hanover. We had barely cranked to a halt and started to set up the ‘ops’ tent, when the Typhoons thundered into the circuit and broke formation for their approach. As they landed on the hastily repaired strip – a ‘Jock’ [Scottish] doctor raced up to us in his jeep.‘Got any medical orderlies?’ he shouted above the roar of the aircraft engines. ‘Any K rations or vitaminised chocolate?’‘What’s up?’ I asked for I could see his face was grey with shock.‘Concentration camp up the road,’ he said shakily, lighting a cigarette. ‘It’s dreadful – just dreadful.’ He threw the cigarette away untouched. ‘I’ve never seen anything so awful in my life. You just won’t believe it 'til you see it – for God’s sake come and help them!’‘What’s it called?’ I asked, reaching for the operations map to mark the concentration camp safely out of the danger area near the bomb line._‘Belsen,’ he said, simply.__Millions of words have been written about these horror camps, many of them by inmates of those unbelievable places. I’ve tried, without success, to describe it from my own point of view, but the words won’t come. To me Belsen was the ultimate blasphemy.After VE. Day I flew up to Denmark with Kelly, a West Indian pilot who was a close friend. As we climbed over Belsen, we saw the flame-throwing Bren carriers trundling through the camp – burning it to the ground. Our light Bf 108 rocked in the superheated air, as we sped above the curling smoke, and Kelly had the last words on it.‘Thank Christ for that,’ he said, fervently._And his words sounded like a benediction. Banksy's internet-based manifesto contained an account by Mervin Willett Gonin DSO of the immediate aftermath to the liberation of Bergen-Belsen, including an extract from Gonin's diary sourced by the Imperial War Museum. Leslie Hardman, British Army Jewish Chaplain and Rabbi, was the first Jewish Chaplain to enter the camp, two days after its liberation, and published his account in the collective book "Belsen in history and memory"
In his book From Belsen to Buckingham Palace Paul Oppenheimer tells of the events leading up to the internment of his whole family at the camp and their incarceration there between February 1944 and April 1945, when he was aged 14 – 15. Following publication of the book, Oppenheimer personally talked to many groups and schools about the events he witnessed. This work is now continued by his brother Rudi, who shared the experiences.